“Sleeping off the job”—or what I’ll call “off(ice) napping” (my meld of “office napping” and hockey player “off-ice” time)—should include more than sleeping at home on the train commute home or on a grassy knoll in the park across from your office during a lunch break. 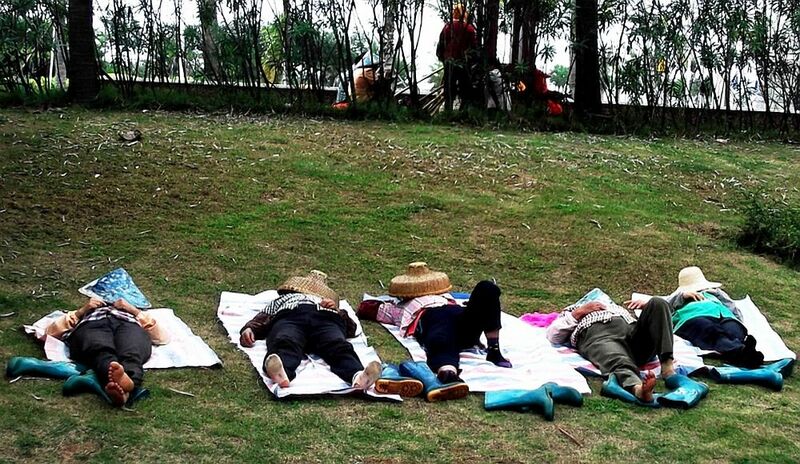 It should also include sleeping at your work site, like the naps these Chinese workers are taking on an onsite grassy ocean-side knoll in Haikou, Hainan Island’s largest northernmost city—a tourist springboard to bluer beaches, such as famed Yalong Beach, at the island’s southernmost shores. Whether their boots are for working at, on, next to or in the sea, these ladies appear to be sleeping at the job, but while off work, i.e., “sleeping off the job”, rather than “sleeping on the job”, which not only sounds worse, but also is worse, since it can get you canned, if you are not paid as a guinea pig in sleep experiments. Moreover, “sleeping off the job” is aptly analogous to “sleeping off a bar binge”, both suggesting recovery as well as the responsible venue, just as “off(ice) nap” does. Although many countries, such as Mexico and China, have traditions and policies that encourage workplace napping on breaks, and despite reported health benefits of midday naps, e.g., a 37% reduction in the risk of cardiovascular disease, cardiac failure and death, the institutionalization of off(ice) naps in the West lags far behind its establishment in other countries and cultures. Nonetheless, that health benefit seems to be enough of a reason to allow, and perhaps encourage, off(ice) naps. But there are more good reasons for napping off the job: In a 2009 Seidman Business Review article, “A Case for Naps in the Workplace”, Jitendra M. Mishra suggests that napping is a natural low-cost way to increase worker productivity. Despite widespread resistance to the idea, Mishra maintains that ”the concept of napping is going through a slow evolution because of the concerns about the ‘bottom line’, reduced productivity, and profits due to sleep deprivation”, which is estimated to cost U.S. businesses $18 billion annually. As particularly dramatic examples of the dire consequences of sleep deprivation, Mishra notes that disasters such as Three Mile Island, Bhopal, and Exxon Valdez were all associated with workers suffering from a lack of normal sleep. However, Mishra points out that, despite strong traditions in China, India, Italy, Greece, North Africa and Latin America, and accumulating evidence supporting the case for off(ice) naps, less than one percent of companies allow employees to a nap on the job. You have to remain upright, e.g., you can’t rest your face on your keyboard—a rule designed to preserve the appearance of engagement. Your company rank has to be very high (or, less commonly observed in my experience during my years in Japan, very low). My own firsthand experience in formal meetings confirms these rules. On one occasion, while I was the Director of International Studies at a Japanese women’s college, the “rijicho” (pronounced “ree-jee-choh”)—the top corporate boss, who had flown in from Tokyo—was presiding over and speaking at a meeting for all key personnel. At some point during his talk, one of the attendees immediately to his right, but at ninety degrees to him (as befitting the highest-ranking subordinate), appeared to nod off, eyes shut as tight as the seams of a fried dumpling. Although the staff member was a full professor of the highest rank, I was puzzled, indeed, amazed, that he would do that and that no one tried to nudge him—especially since he was seated right beside the boss (who was generally, and rightly, feared by all employees). When I whispered my puzzlement to a colleague at my side, he, also discreetly whispering, told me that such apparent napping is in fact a “sign of great respect”, indicative of deep concentration and appreciation of the rijicho’s deep and important ideas. Yes, he really said that—even if it was only to help the professor save (napping) face. Anyway, no one else—including the rijicho—responded in any way to the napper. Although I didn’t buy the explanation at all, I could see that general acceptance of such a cover story would be essential to the successful institutionalization of inemuri. Following that logic, the deeper the boss’s ideas, the deeper the sleep should be, with the full comatose sprawl like that of the Chinese ocean-side women being the ultimate form of profound homage and respect. Ironically, in their full sprawl, those Chinese workers were apparently more alert than the Japanese professor appeared to be (despite the dubious “concentration” claim made on his behalf). Rather than being poster children for the world’s exhausted, bone-weary laborers, some of those women were not only awake, but cheerily humming under their work hats (which probably make great resonance chambers for on-the-job karaoke). That ritual was tedious and tiresome enough for me to want to close my eyes (and ears) for some well-deserved inemuri—which, however, would probably have backfired on me. My Japanese colleagues would probably have interpreted that as deep meditation on and respect for the ritual and its rules. Note: This is one in a series of articles by Michael Moffa, written while on the road, on the scene and on the job in China, autumn 2012.